Parents who are aware their child is having a difficult time with reading, mathematics, written expression or other aspects of school work might suspect that the child has a learning disability (LD), also known as specific learning disabilities (SLD), and may be in need of special education services. As a parent, guardian or advocate, you have a legal right to request that your public school evaluate your child for special education. Read LDA’s Position Paper on Right to an Evaluation of a Child for Special Education Services to learn more about this important legal right and the first step towards helping your child in the public school. My daughter has a milder for a ld but she drives and is high functioning. there has never been a in between in her school it was either with the general or the opposite very low functioning students. but now she needs to go to college and i have no one to help me figure this out. i took her to the junior college and they just threw her into the very low functioning classes that would do nothing for her. She cannot be in the general classes because it is more difficult i cannot beleive no one has a in between. I feel it is wonderful that you are sharing this information with the public and in turn making it easier for the public to understand the special education process. 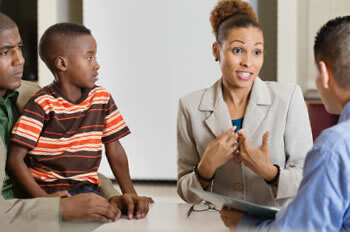 However I encourage you to revise your statement to suggest that parents first contact their child’s school to discuss their concerns PRIOR to making a referral. Many times parents lack a sufficient understanding of the necessary criteria to qualify a student, have misconceptions of their child’s actual performance, or are unaware of the intensive interventions and supports (including tracking and monitoring) that their child is ALREADY receiving. In turn we are encouraging parents to make poor referrals which then put the child through an unnecessary process, waste school resources, and tie up valuable staff time (were they could instead be working one on one with the student or crafting quality interventions). AND AS HIS GRANDPARENT I NEED HELP FROM THE SCHOOL OF WHICH I AM NOT RECEIVING. LACK OF SUFFICIENT UNDERSTANDING OF THE NECESSARY CRITERIA TO QUALIFY A STUDENT, HAVE MISCONCEPTIONS PLEASE HELP ME UNDERSTAND!!!!! Angelia, check out wrightslaw.com. I just bought the book and he walks you through how to appeal the decision and navigate the system. Invaluable!